As the cyber crime is rate is increasing in India also in rest of the world. Hence there are some steps taking by the Indian government also to prevents it. Recently there is a organisation was opened in some of the state of India namely as "Cyber Cell", which see the cyber crime activities in India. Same as one state name as "Jharkhand" have taken the initiative to stop cyber crime. Recently, BSNL of Jharkhand have decide to make a data center in Ranchi and an Anti-Cyber Crime Organisation also to be formed. For the people of Jharkhand, there is a helpline number [1800-345653] allotted for the public for any cyber crime issues.. as like Bank fraud, ATM fraud, Bank account hacking, etc.. The chief technical officer of Cyber Defense Research Center , Mr. Vineet have said that, "this will help the people against cyber crime activities. 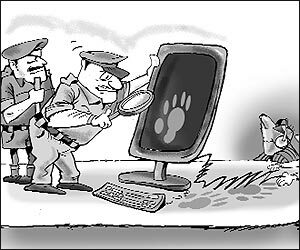 As there are regularly 4-5 cases of cyber crime on daily basis. On this help line number [1800-3456533] people can logged a complain against cyber crime. Some of the officers are getting trained for the tele process of the number. Jharkhand special branch IG say's that soon there will be a cyber lab to solve the cyber crime. For this Data Security Council and NAASCOM is also ready to support them. To catch the cyber criminal, Jharkhand police is also a part of International campain. Of this Jharkhand is collaborate with the American social project name as "Honey Net" . Cheif officer of CDRC says that Honey net is the net to trap the hackers.. For this they keep a vulnerable server, on which there will be a fake data. As hackers tries to attack this server they get the alert and they trace the hacker.